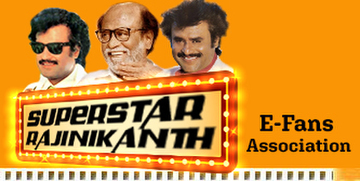 It is two weeks since the release of Rajnikanth’s Chandramukhi. How big a hit is the film? Talk to anyone in the film trade and they all agree that Chandramukhi is a hit, but how big? The answer varies from person to person. It also depends on the person’s loyalty or dislike for the superstar. The worst kept secret is that the industry has always been divided into two camps- those who swear by Rajnikanth, and those who say that his days are over! Sify.com walks the thin dividing line between the two diverse views and tries to fathom the report card of Chandramukhi Please note that the figures that we are talking of, may not be authentic as there is no centralized rating system to show how a film works across Tamilnadu. In a big city like Chennai, the figures are authentic but beyond the city limits theatres refuse to divulge the figures and most of them do not even pay entertainment tax as they are hand in glove with the local administration to make a fast buck! Anyway, to the best of our knowledge Chandramukhi is a super hit! All theatres which had paid huge MG (Minimum Guarantee) have recovered their money in about 10 days! Take for example- Vetri theatre in Chrompet, a suburb of Chennai which is said to have paid Rs 20 Lakhs MG, and according to trade sources the theatre recovered the amount in five days and thereby created a new record. Like Vetri, all theatres were charging arbitrary rates of admission ranging from Rs 100 to Rs 300 in the opening weekend. Most of the theatres outside Chennai city, with a seating capacity of 600 had almost 1000 people watching each show on extra seats, standing and even sitting on the floor! The government says that there should be only four shows but most of the theaters that screened Chandramukhi had five to six shows per day! The rumour mill has it that Vetri theatre had collected Rs 7, 62,000 gross on the first day making it “unofficially” the highest collection from a single screen for a day in India! 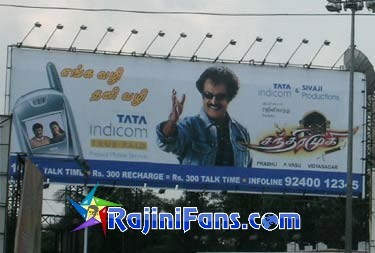 Remember, this can happen only with a Rajnikanth film! He is the only superstar after the late MGR who can entice an ordinary movie going public to part with their hard earned money for three hours of pure fantasy. By extending this logic to other centers screening Chandramukhi in Tamilnadu, only idiots will say that the film has bombed. In plain arithmetic’s, those who had a business deal with Sivaji productions (the producers of the film) – the distributors and exhibitors, all made money. Forget the trade, even Chandramukhi’s ancillary small scale businesses, like the canteen contractors attached to theatre, cycle and parking lot, auto rickshaw men who fleeced passengers running from one theatre to another screening the film to get tickets and the black marketers – all made a killing out of the film! Let’s start with the most famous quote of Amitabh Bachchan which is relevant to Rajnikanth today. In an interview to the “Filmfare”, in 1975 after “Zanjeer”, “Don” and “Sholay”, the actor said: “To be a successful actor, in a commercial set up you need about 3 percent talent. The rest have to be made up by business sense, patience and luck. And the real problem is not to get there but to stay there”. ll this percolates down to the common man who views his films as something extraordinary. Long before April 14 dawned, an ordinary man on the street had made up his mind to go and watch Chandramukhi at any cost. Initially, distributors were a little wary of the film but when they met the people at grass root level all of then said Baba was an aberration. So taking courage into their hands little known distributors like Seenu and Balu of Cinepark theatres, Tirupur ventured into distribution by quoting and getting Chandramukhi for Coimbatore area at an astronomical price (rumoured to be Rs 2.5 Crore which includes cost of 24 prints). Later as Chandramukhi hype reached the crescendo, they were able to get nearly Rs 2.20 Crore as MG amount from 24 theatres in that area. And even if the film flopped they would have covered their Rs 30 Lakh difference by screening at 50 odd B and C centres in the area. Today after Chandramukhi became a hit, trade analysts say that it will collect over Rs 3 Crore from Coimbatore area beating the previous record of Rs 2.45 Crore created by Padayappa. Chandramukhi’s enhanced ticket rates also helped the distributors to recover their money at a faster rate. Sanjay Wadhwa, the overseas distributor of Chandramukhi says: “The film is a sensational hit all over the world and everyone who did business with the film made money. I do not want to divulge any figures”. According to industry grapevine, Chandramukhi should do business worth Rs 20 to Rs 22 Crore from Tamilnadu theatrical rights. It is beyond doubt that the film is a super hit as it was sold to distributors at Rs 16.5 Crore. The film is still going strong in Chennai city theatres, NSC, Coimbatore and Madurai areas. In Chennai city, it is poised to break the Padayappa record of Rs 1.45 Crore distributors share at the end of the third week. Chandramukhi was such a big hit also due to the liberal attitude shown by State Government. Last year they had reduced entertainment tax from 25 to 15 percent the lowest in India. The crackdown on piracy has created fear psychosis among video lending libraries. Added to that political parties opposing Rajnikanth did not create any problems especially in Rajni core area like NSC. All these factors plus a weak opposition from films like Mumbai Xpress and Sachien made it easy for Chandramukhi to emerge the winner at the Tamilnadu box-office. Chandramukhi is turning out to be bigger than Padayappa or Baasha, in terms of box-office collections! All existing box-office records are being swept away by the Chandramukhi tsunami wave at turnstiles. It has become the favourite summer outing among families all over Tamil Nadu and there is a repeat audience for the film. This clearly indicates the final verdict that Chandramukhi is a blockbuster of gargantuan propositions. In Chennai city (in 21 days) the film has collected a distributors share of Rs 1.27 Crore and is all set to break the Padayappa record of Rs 1.45 Crore! According to a trade analyst, the film may garner Rs 2.25 to Rs 2.50 Crore from Chennai city alone in the long run, making it the highest collecting film in history! In Kovai territory, comprising Erode, Tirupur, Coimbatore, Nilgiris and Pollachi on 24 prints, Chandramukhi collected Rs 2.36 Crore in 21 days and may become the first ever film to cross the magic Rs 3 Crore figure from this area in the long run. In Tamil Nadu’s biggest territory the NSC area (North Arcot, South Arcot and Chengalpettu) the film is likely to get a distributors share of Rs 8 Crore! And down south in TK area (Tirunelveli- Kanyakumari) the collections are likely to be Rs 1.50 Crore twice of what Padayappa did! If one were to go by these figures, then Chandramukhi will do business worth Rs 22.5 Crore from theatrical rights in Tamil Nadu. The normal practice in film trade to calculate the box-office takings of a mega blockbuster is to multiply the Chennai city distributors share by 2.5 = Tamil Nadu distributors share. And if family and repeat audience continue to support the film till the schools reopen (June 1) and there after if collections don’t drop drastically and average around 50 percent, then Chandramukhi may do theatrical business worth Rs 25 Crore from Tamil Nadu. In Bangalore, Rajnikanth’s home town Chandramukhi will do Rs 1.50 Crore and from rest of Karnataka another Rs 1.50 Crore making it Rs 3 Crore. From Kerala the film is likely to make a distributors share of Rs 1.50 Crore. In Andhra also the Telugu dubbed version of the film is a super hit and is poised to make around Rs 8 Crore! And in other North Indian belts like Mumbai, Pune, Belguam, Ahmedabad, Ranchi and Delhi it has a potential to collect Rs 50 Lakhs mainly from multiplexes. Overseas also Chandramukhi is a big hit especially in Malaysia, UAE, US and as per trade buzz, the film will be the first Tamil movie to do business over $ 1 Million (Rs 4.3 Crore). It is expected to do Rs 7 Crore overseas including DVD and local TV rights.